Billy Bang, Myra Melford, Bubblyfish, Joe Reinsel, and John McCowen. Mahavishnu John McLaughlin Goodbye Pork Pie Hat My Goal's Beyond Douglas 1971 The guitarist's masterful version of the classic tune written by Charles Mingus as an homage to Lester Young. David W Solitude Ridgewood Noise Library Beautiful Drummer 2018 Grateful for your company. Myra Melford Solo Concert Recording Roulette Concert Series Roulette Archives roulette.org 1 Nov 97 The composer/pianist in a free roaming set using a partially prepared piano. 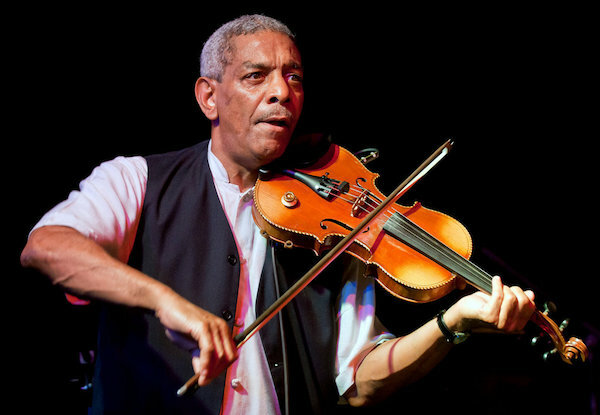 Billy Bang Solo Concert Recording Roulette Concert Series Roulette Archives roulette.org 13 March 06 The great free jazz violinist, Vietnam vet, and veteran of the String Trio of New York, Sun Ra, and legendary Soul Note albums. John McCowen Solo Concert Recording Che Chen's Fire Over Heaven Series Outpost Artists Resources 15 Nov 18 A journey through the depths of the contrabass clarinet. Bubblyfish Concert Recording Roulette Concert Series Roulette Archives roulette.org 17 Oct 03 Haeyoung Kim hacks game devices to build evolving 8-bit fantasies. Joe Reinsel Concert Recording Roulette Concert Series Roulette Archives roulette.org 17 Oct 03 The MAX/MSP/Jitter master out of Baltimore explores some acoustic artifacts. Happy Wednesday, David, Ruth, and all! Awww missed Pork Pie Hat great version (have the old LP home, haven't heard it in a while). Had some trouble connecting but clear signal now . Hello, David, Ruth. the Ridgewood collective, and all. Attentive but relaxed, an unassuming position. Hello Sem and all. As you can see we are a little distracted here today. Myra Melford, huh ? Great recording! home for lunch, get to listen relaxed for once! Thanks david! I'll clean it up for the archive. Myra Melford, new to me (for some reason). Why don't I know him? Of course I know Billy Bang, but also not familiar w/ John McCowen. Bubblyfish is an old friend of mine, can't wait! Myra has been in California for years now but she was a major part of the downtown scene 80s-90s. Whoa, that incoming bunch sounds excellent. No rest for the wicked! @stevo: I learned that term from our esteemed Mr. Schulkind! Feel free to embarrass my wife tonight (she's documenting it for me). Actually NGH I'm looking forward to honoring her with the best seat in the house. My kinda show happening up in here. Hey, Jeff. Yeah, its going to be a slow fade from jazz to wha??? When I first moved to NYC, I saw Billy Bang at Stonewall. I had to ask, is this THAT Stonewall?!!!! Indeed it was. Memorable show! I think last Friday Doug Schulkind said that he thought musicians who groan and sing while they play is a sign of greatness. Muhal also. And then there is the wonderfully silly controversy over Glenn Gould "ruining" his Bach recordings. I groan when I sit down. I'm a great sitter. What a great take on Ornette's Lonely Woman! A deeply delicious instrument, and McCowen makes it groan beautifully. I'm just back from the pub and I'm ready for anything. Now there's a challenge from a confident man. Nice, Stanley. We haven't popped the first cork yet. But tonight!!! was that really 20 minutes? time flies when you're having fun! Ha steveo. You went to the deep place. Hey, geezelle... i'm totally sideways now. Thanks in advance, and have a great gig tonight! Happy holidaze, David, Ruth, and all ! Thanks, all. Enjoy whatever time off you have with the good people. I thought this Reinsel was a nice transition into Kenzo. See you soon! Coming up now here on the Drummer stream: Brand new live sound collage, "Just when I needed you most." thanks David, Ruth and anyone else I've missed, and to all a good night! Thank you, David, Ruth, and all. Ears holes happily filled to over-flowing. Thanks David. Always a pleasure. Have fun tonight! All the creatures are stirring! What Sem & Steveo said!